Smart Home Security Gadgets Explained - Which? From security cameras and door sensors to pet trackers and smart plugs, we explain the typical gadgets in a smart home security system. 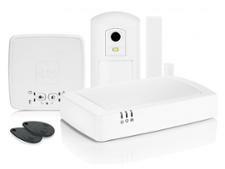 What makes up a smart home security system? The answer is, it’s really up to you. While brands such as Panasonic, Samsung and Yale all offer one-box smart home security kits, most manufacturers also sell extra devices that can be added on separately to build a system bespoke to your needs and property. And different kits contain different combinations of gadgets. A smart home security system can be as simple as a central hub combined with motion and window/door detectors that alert you to movement in the house. But if you like the idea of watching what’s happening at home live on your phone, or turning a lamp on from afar, then there are other gadgets you’ll need to look out for. Some systems are only compatible with add-ons from the same brand, while others, such as Samsung’s SmartThings, enable you to connect third-party components. Find out more about compatibility in our smart home security systems buying guide, and read on to discover more about the main gadgets available for your smart home security system. 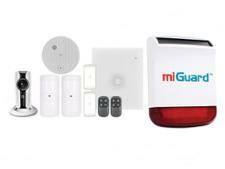 Don't miss our hands-on reviews of the latest smart home security systems. This is the heart of the smart home security system which must be connected to your broadband router, either by a cable or using wi-fi. The hub allows you to control each of the individual system devices using a single app on your smartphone. The hub wirelessly connects and communicates with all of the other gadgets that make up your smart home kit. Different systems communicate using different wireless protocols (akin to speaking different languages). Some systems will use simple wi-fi to communicate, others use a manufacturer's proprietary (own-brand) system and/or an open system, such as Z-Wave. Your system will only work with components and gadgets that speak the same language. Manufacturers argue that their own proprietary systems offer greater security, but this also means that you’ll be limited to buying only gadgets from the same brand. When carefully placed, these can capture images and/or video of intruders, which may help the police to track them down. Footage can be viewed in real time and can usually be recorded onto an SD card. Cloud storage of video or stills may also be available (depending on the system), but can involve paying a subscription fee. While wireless security cameras can provide peace of mind about your home’s security, they can also help you keep an eye on a pet when you’re not at home or a baby that’s in another room. We've tested and rated some of the latest models – see which hit our Best Buy benchmark, and which are best avoided, in our wireless security camera reviews. Just like the motion sensors supplied with traditional alarm systems, these monitor when someone is moving around the room and can send an alert to your phone. Some motion sensors are ‘pet friendly’, so your cat shouldn’t set off your alarm. These allow you to turn lamps or appliances on and off using your smart phone, or program things to turn on and off automatically. When you’re out, using a smart plug with a lamp is a quick way to make it seem as though someone is still at home. Smart plugs can also be used for convenience – for example, you can set the kettle up the night before and switch it on from bed using a smart plug. You could also use a smart plug with the iron and never worry about it being left on. These are sensors that attach to doors and windows and monitor whether they are opened, allowing you to receive an alert or activate another component of the smart home security system – a light (via a smart plug) or siren, for example. These can be a handy way to tell when pets or other members of your household arrive home. The sensor monitors when individuals fobs (‘tags’) supplied with the system arrive back at the property. Different systems can then be activated accordingly. Tag sensors can be used to keep an eye on when teens get home or receive alerts if a vulnerable person hasn’t returned home as expected. When we surveyed 104 reformed burglars (November 2015), an alarm system and dogs were the biggest turn-offs when it came to selecting a property to break into, deterring 71% of those surveyed. However, alarms can only act as a deterrent if burglars realise they’re there, which is where a visible external siren can come in handy. 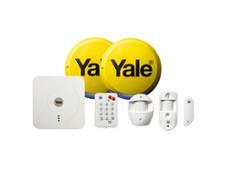 Some smart home security systems, such as Yale’s, also contain a dummy siren, which can also act as a deterrent. Indoor sirens can help alert people at home when motion is detected in another part of the house and could scare off skittish intruders who have broken in. Each system has an associated app that you’ll need a smartphone or tablet to use. You may need to use the app during set-up, and it should allow you to control the system and receive alerts once everything is installed. The app will also allow you to set up certain rules – for example, you could set a lamp to be switched on (using a smart plug) when the tag sensor picks up that someone has arrived home.